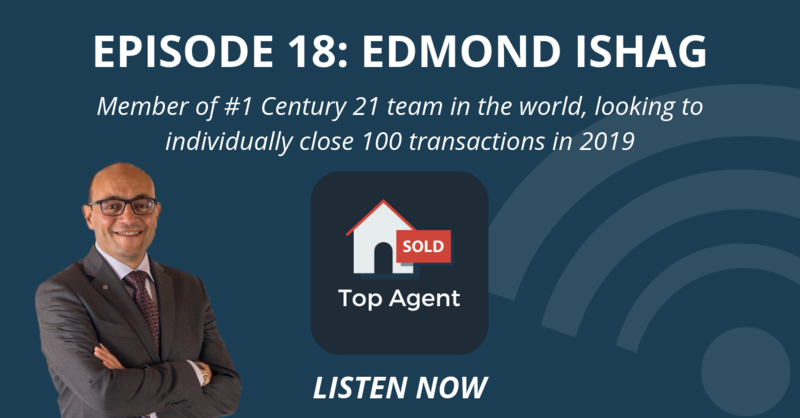 Kosta: In this episode, I’m speaking with Edmond Ishag a Broker with Century 21 in Toronto. He’s a member of the Ken Yeung team, which is the number one Century 21 Team in the world. Edmond’s success in real estate comes from very pragmatic and straightforward strategies. He did over 40 transactions last year alone and has aims to hit 100 transactions in 2019, which is insane. I had a great time speaking with Edmond, so I hope you enjoy our chat! 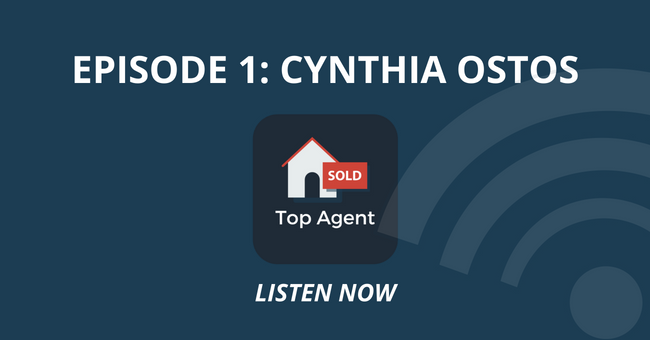 Edmond, thank you so much for joining me on the Top Agent podcast, I really do appreciate it. Edmond: Thank you for having me. Kosta. Kosta: Amazing. So Edmond, if you want to kick things off, just please introduce yourself, tell our audience a bit about yourself, some of your career highlights and how you got into real estate. Edmond: Oh Great. So I’ve been an entrepreneur for over 20 years now and I’ve been with Suncor, which used to be a Petro Canada as a franchise, I run some businesses. Was with Petro Canada for almost 13 years and then in, 2009 or 2008, I joined the real estate market had been in the same company for quite some time and uh, yeah, it’s been a, a quite of a journey. Lots of great experiences and I love it so far. Kosta: Amazing. So, so 10 years in real estate. So, you know, in the real estate game you can consider yourself a veteran at that point. I think, uh, you know, as you know, real estate is a, it’s a high turnover business. You know, agents sort of come and go, as I’m sure you’ve seen. So what do you credit your success to and why have you lasted in the business this long? Edmond: I love it, I love to deal with people, I love to explain to people, um, about real estate and so much that I dream of it and that’s what made it last. If you love your job and you love to talk to people because you interact every single day was different people, you will find it really good. Kosta: Yeah, that’s all true. I think, you know, a lot of people now they know they have jobs or they’re doing things that they don’t really love. They might I like it, but they don’t really love it and have the passion for it. So I think that’s a really big contributing factor to being successful is just making you love what you’re doing because then it doesn’t feel like work. Edmond: Yes, that’s true. It doesn’t feel like work. It feels like it’s in your blood to your everyday work. Kosta: Exactly. Um, so what are some of the biggest challenges that you think a realtor faces nowadays? I mean, whether it be dealing with customers or with market conditions, lead generation or anything else, but what are some challenges that you’re seeing in the business today? Edmond: So, um, I find from my own perspective or from my own way of doing business is that people need to be informed and what I mean by people, our clients and your leads and uh, everyone that deals in real estate business, they need to understand what’s going on in their surroundings. People who are selling, people who are buying a people who are investing and what’s the finance before this and after that. And that’s what I find as challenges and my line of work as that people don’t know how to process the finance of buying and selling and why is it buying a selling? So I, I call it and I’d say people may be need to understand what’s going on. Kosta: Yeah, that makes total sense. Um, what about like in the day to day challenges that you face, like, you know, in regards to maybe networking or lead generation, do you see any challenge or opportunities there? Edmond: Opportunities are everywhere. Need to know my numbers is very important. Lead generation is um, um, it’s a great thing to have. I’m just need to know where to get those kinds of lead generations is going to be a, facebook is going to be past clients is going to be door knocking. Um, it’s, it’s really good. Kosta: Yeah. So let’s talk about marketing a bit more. Our audience loves when I sort of deep dive about into marketing, you know, so you’re, you’re, you’re pretty active online with your website and social media. You’re really working the online side of things, but what are some of your favorite marketing strategies that are providing you the most leads or the most Roi? Edmond: So I, I am relying on database a lot and also on facebook, instagram. So what I do is I try to put the most information that I can give an order for people to catch the eyes. I do a lot of preconstruction. We do a lot of preconstruction as a team. And um, I usually say I put a new good information about the project and asked people to give us a call or go to the website in order to get more information. Do we get calls and leads? We get a lot of calls and leads from facebook, instagram, and also database. Kosta: So are these leads coming you’d say organically or are you paying like facebook ads or instagram ads? Edmond: No, we pay, we pay and instagram ads and we pay for um, a facebook. Kosta: Okay. So that’s great. So you’re getting consistent leads with the paid strategy. So there’s definitely the ROI there. Amazing. Any, any offline marketing strategies to do like you mentioned, door knocking? Edmond: Yes, we do door knocking, we do flyers and we also uh, uh, do postcards, postcards, door knocking as a. and I love it, I adore it. So door knocking is something that I really adore. I know in the winter time is not as much as spring and summertime, uh, but it’s just that people to get to know people face to face, they trust you rather than the phone. They don’t know who you are, what’s going on behind that line, face to face. I find it’s great interaction and they always give you a lead if they trust you. Kosta: And that’s for sure. And so, with door knocking, do you farm certain communities or areas? Edmond: Yes, in my neighborhood I do farm, I always put flyers to let them know what’s going on. I door knock and a good times. Uh, yeah. Kosta: And do you have like, do you track your numbers in terms of like, you know, conversion or um, you know, with door knocking or how many listing appointments you get per, let’s say 100 doors knocked. Edmond: Yes. So tracking numbers it will make you better. And this is my advice, tracking numbers, door knocking or phone calls. It will make you a better person because it, it tells you where are you weak and where you need to be strengthened. Uh, yes, I do track my number. So if I’ve made a face to face interaction out of 10, I would say I would get 2 appointments which is 20 percent, is high. It’s very high. And also to close out of that 2, I would close 1. Edmond: it is very high numbers, but I, I’d been trained for the past six years, with multiple coaching and um, it’s just got to know how to get to the people’s minds and how could they can trust you. 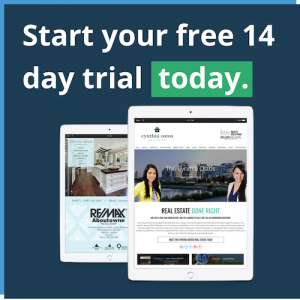 Kosta: Yeah, I see a lot of people are sort of shy away from door knocking, but a lot of successful realtors I speak to that is a big part of their marketing strategy is still to door knock and you know, apparently, hey, if you do it right, it clearly works. Edmond: Face your fear, you will be surprised how many people are there. They pick your language. Kosta: Yeah, absolutely. Changing gears a little bit, so technology as you know is changing fast. Um, how do you think technology is going to change the real estate industry as a whole or even how realtors will conduct their business and say the next five to 10 years when it comes to technology? Edmond: I would say it’s going to be a huge factor tomorrow because people are on, on technology most of their time, a day on the phone, laptop, computers. You are on those most of the time of the day and yes, technology will take over. Kosta: Yeah, it’s a, I think I read a stat, not too long ago. The average person spends, I think it’s six hours a day on their phone. So as a, you know, being a realtor now you know, you’re, you’re essentially, um, you know, in the marketing business as well. So just understanding human behavior nowadays where people are sort of on their devices for that long. So as a marketer, as a realtor, any business really, you got to ask yourself, okay, if this is where my audience is, what can I do to grab some of their attention and, you know, what kind of content can I put out? Or um, you know, what kind of value can I provide? Edmond: Of course we’re talking about a huge thing because we don’t know who’s looking at your ad and the marketing people that we have in our company, they, they study the geographic neighborhood off millennials and so on. And now we kind of like, um, it’s, it’s all like a visual marketing interaction. So from the beginning, the first 10 seconds are the first five seconds when you look at this ad or I want to keep going, I wanted to read it, I want to know what’s going on and that’s what we do every week. We have an appointments with those marketing people working in our company and we get more ideas and how to let people interact with our ads. Kosta: Yeah, that makes sense. Um, so, you know, I’m a numbers guy as well, again, to revenue commissions, all the fun stuff. Can you share with our audience how many transactions you’ve closed last year are planning to close in the next 12 months or even provide a range? Edmond: Um, as a team it’s huge. So Ken Yeung team that they’re number one in the world. So the numbers are so huge, but I’ll talk about myself. He can talk about his own numbers. Yeah, it’s number one in the world and he, he’d been really awesome, humble and a great person to work with. As for me, I have this year, this year I’m doing over 38 plus the resale. So the resale, I had done almost a 18 homes. Um, yeah, and 38 preconstruction. So next year I know my numbers, I want to with my numbers and next year is 100. Kosta: Wow. That’s, that’s big time numbers. Edmond: It is, it is. And at, once you know your number Kosta, you will break it down into 12 months. As I say, I was well trained for the past six years. You would break it down into 12 months. You would break it down and how many days you want to work this month and you will break it down. And how many hours do you want to work a day in order to generate those numbers? And it’s a numbers game. Kosta: Exactly. It’s, it’s simpler to set the goal. And then you reverse engineer and just like you said. Yeah. Perfect, yeah, I love that. Edmond: All you need to do is understand the system, understand the system, work at hard, be consistent every day and you will see growth. You will see growth. Kosta: Amazing. Excellent stuff. Uh, what, what’s the one piece of advice you would give to either a new realtor or someone who’s trying to elevate their business and just take it to the next level. Edmond: New is new people or take it to the next level. I would say, listen, listen to people, listen to your clients, listen to your leads, they need someone to listen to. Kosta: Yeah. Then, you know, very logical sound advice. Edmond: And if I may add, listening is very important. Act plus also look up to someone who is successful not to look and what they do or what they drive or what they were looked up to. So I look up to my, uh, uh, president in this company, Ken Yeung, and he does huge deals but his humble, his stake in one brick at a time. He talks to each client. Uh, so I look up to those type of people in order to become one of them. Is it going to be in a day? No. Is there going to be in a year or. No, it might take 10 years. Kosta: Yeah, I love it. That’s an amazing advice. Um, so Edmond I want to be mindful of your time. I end off each chat with what I call the top three. Are you ready? Okay. So number one, you’re a top real estate or business book. Edmond: Oh, business book. I would love to say I love Darren Hardy. I read his books. The compound effect is an amazing book that I, I found that working with me. It’s one brick at a time. Kosta: Yeah, I’ve read that as well. Edmond: Yeah. And the number two book is I read a lot of books, powerful habits, powerful habits by when the vineyard and it gives you how you can create a great habit that fits you because everyone is different. Kosta: Amazing. Perfect. Uh, and number two, your top vacation spot. Edmond: Awesome. I love the Caribbean. I’ve been to the Caribbean so many times on cruises and uh, yes, I would go there at anytime. Kosta: Nice, Nice. Uh, and Edmond, how old are you? 46. So if you can go back 26 years, what do you wish your 20 year old self knew? Edmond: Wow, I wish I can go back six years. The great advice that I give to myself 26 years ago is take more risks and do a better financing for the future. Kosta: Good advice, very practical. And um, if people want to get ahold of your reach own, where’s the best place they can find you? Kosta: Perfect. I’ll add that in the show notes as well. Alright, Edmond. Thank you so much. A real pleasure speaking with you. Thank you so much again for coming on the show and, uh, we should definitely do it again sometime. You’re an amazing person and an amazing. Thank you. I appreciate it. Thank you. 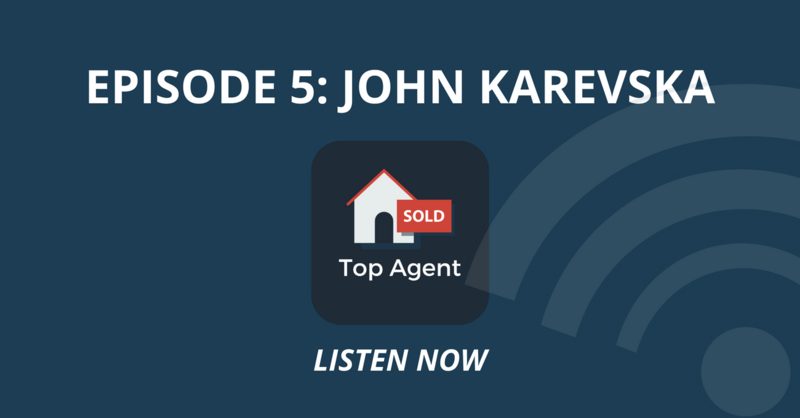 Thank you so much for listening to the Top Agent podcast by Web4Realty. 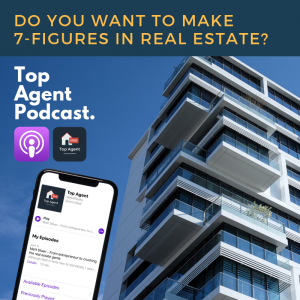 By the way, we’re providing exclusive promos to our listeners, visit web4realty.com/topagent and get your first month on us. That’s web4realty.com/topagent to get your first month of service completely free. Until next time. Over and out, peace.